The RMDK Slim Shore light duty props are a trusted product which is ideal for many refurbishment applications, such as lateral restraint systems to unstable buildings, formation of structural openings (needling or needle supports), back propping and transfer of loads to enable safe column removal. Slim Shore light duty props offer a high leg load to weight ratio; for example, using as a single prop can accommodate a maximum load of 120 kNs at 3 metres in prop length. The Slim-Shore is primary used for form-work, based on the versatility of its strength to weight ratio and range of accessories they can be easily assembled with beams of various length, the props can be used for numerous temporary works applications. 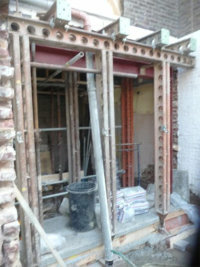 Supporting structures for pre-loading or remedial works. Needling wall supports when forming new openings. 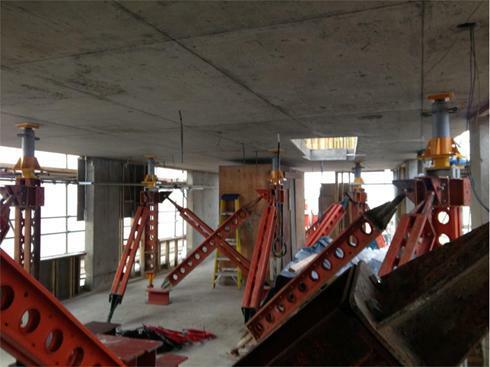 Temporary propping for steelwork installation. Facade retention / space frames. Bridge cantilever edge and deck form-work supports. Hydra-Capsule Limited can also provide integrated hydraulic jacking systems for pre-loading, precise lifting or lowering of heavy structures and buildings, alternatively we can offer heavy duty props.